This is part of a mini-series on our competitively priced budget label Fabulous under the banner of Jazz Legends, presenting some of great and influential names of jazz, with recordings drawn from the classic era of the genre’s development between 1920 and 1950. 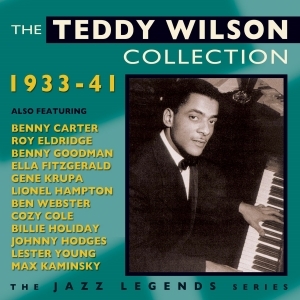 With a sophisticated and elegant style, Teddy Wilson has been described as the definitive swing pianist, an accolade which meant that he was ubiquitous on the recording and recording scene through the ‘30s and ‘40s, and his skill as an understated but stylish accompanist in small groups with singers like Ella Fitzgerald and Billie Holiday was a notable feature of his work, and was house arranger hired for Brunswick in the mid-30s.This collection cherry-picks from his large body of work from the dawn of the swing era through to the post-war years, featuring recordings with his own band, including tracks with the great vocalists mentioned above, along with his work with Benny Goodman and others. Inevitably, it also features many illustrious contemporaries in the line-ups, and is an excellent showcase for his distinctive easy style.